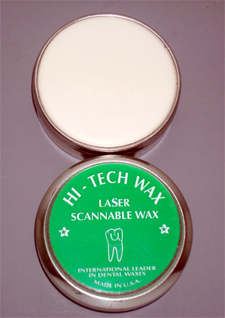 This wax will allow you to wax up and scan without using metallic powder spray. it also builds up fast and is designed to be stable and carve-able. With this wax you will save money and valuable time for all your laser scanning systems. 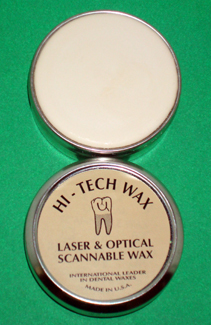 This wax will allow you to wax up and scan without using metallic powder spray. It builds up fast. It is very stable and carve-able. 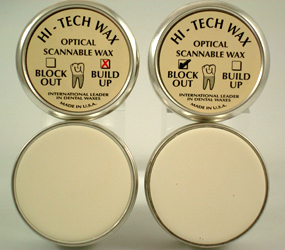 This wax come in two types, one for build-up, and the other for black-out. This new technologically advanced formula is made to accommodate all CAD/CAM and other scanning systems because it has the ability to disperse and block both Laser & Optical rays for complete and accurate reading with elimination of metallic powder sprays. It is very stable, builds up fast and has smooth carve-ability. This wax is created to be used in impression to expose the prepared margin for cases that require scanning and removal of tissue for better margin exposure. When you use this wax do not spend a lot of time grinding the stone. 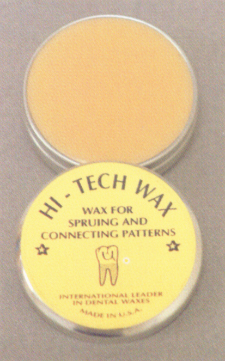 This wax is easy to use and will stick to most impression materials. After pouring the model, it is easy to remove it from the stone so your margins are exposed to scan or to go. This wax is the latest generation in the family of HI-TECH Scannable waxes; if is designed to allow CAD/CAM systems through 3-D scanning technology to record occlusal morphology & determine vertical dimension. This wax designed to use with pre-articulated models. 1-Warm: to enhance malleability, warm the area of wax strip with warm water until malleable. 2-Bite: take the bite registration from an articulated model. 3-Cut: use scissors or cutting knife to trim the warmed wax; let it cool. 4-Scan: remove the cooled wax and scan. 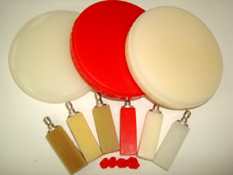 As a modern technician, you know that the Cad/Cam’s milling system is the most advanced technology in dental field right now, and technicians still facing problems with SYNTHETIC milling discs; so HI-TECH WAX Company has solved that problem by creating a unique Cad/Cam milling discs composed of pure waxes mixed together to give smooth milling and high accuracy. 4- Burns-out very clean with-out leaving any residue. 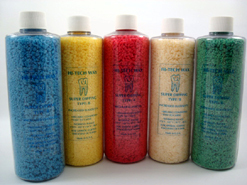 5- Allows you to use either diamond burs or carbide burs. 6- Works with water and dry cad/cam milling system. 7- Lets you get smooth and precise margin with excellent fit for copping and full crown. 8- Lets you get the best casting results. 9- Saves you time, and allows milling burs last longer. 10- Lets you to repair any accidental defect by using digital spatula or Bunsen burner spatula just like regular crown & bridge waxes. * Customized color available depends on quantity. 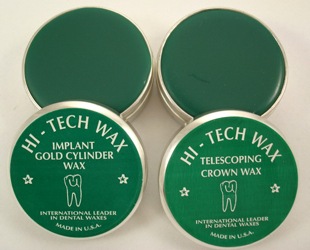 This unique wax is specifically designed to bond to gold cylinder abutments and will allow you to wax a full cast crown, carve it and finish the margin as well, all with one wax. 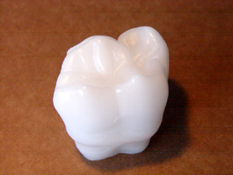 This wax is especially engineered to meet custom abutment needs. It will not pull away from metal or any other type abutment. You can work a full cast crown, carve it, and finish the margin with great accuracy. 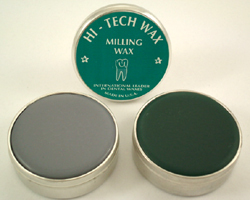 Hi-Tech milling wax is an excellent combination of a milling and sculpturing wax. It is dimensionally very stable, strong yet carvable. 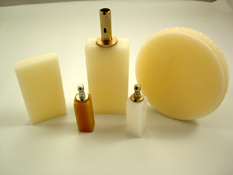 When milling, the wax does not stick to the wax cutter. SHC - Secure Hold Crown is created to provide temporary firm gold to loose fitting crowns, veneers, and similar restorations. It offers technicians the confidence and freedom to rapidly build porcelain without hassle coping falling off the due. SHC is made of a clean burning pure natural substance. 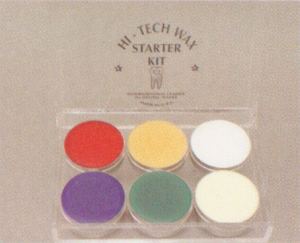 Hi-Tech Diagnostic waxes belong on an artists' palette with numerous opaque foundation shades and translucent incisals. They cover the chromatic spectrum of the traditional shade guide. This Diagnostic Waxes feature the best quality of sculpturing waxes including the tensile strength to increase durability. 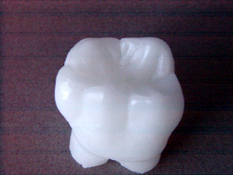 The high luster of this wax mimics the "vitrification" effect of ceramic crowns. This diagnostic white translucent wax is designed with intricate details that portrays accurate anatomy of the first upper and lower molars. Carvability without compromising strength. Primarily formulated for occlusal anatomy, and to strengthen weak points. 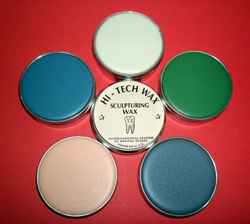 It is the dream wax for modern technicians. 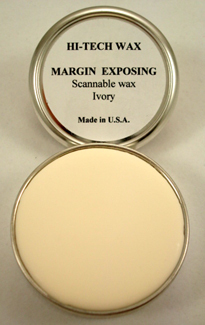 If you are looking for a wax that builds-up fast in any room temperature, has strength, carves nice and especially does not pull, flare or expand at the margins, this is it. 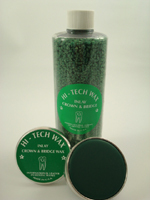 Hi-Tech "PRO CARVING WAX" is a superfine versatile multi purpose wax designed for every aspect of ceramic, crown & bridge waxing. Strength and effortless carving are the seeming paradoxes of this wax which virtually eliminates the need for margin wax! This wax especially formulated to be very stable with a degree of fluidity that allows it to flow and fit perfectly in cervical areas, with just the right elasticity and flexibility to produce sharp clean and accurate margin. 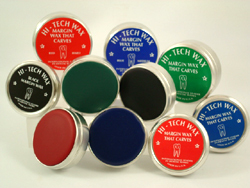 This new generation of Margin Wax rivals it's competition due to its high visibility, carve-ability, and smooth surface, which helps eliminate jagged margins, over extended margins, over extended margins, and rough margins. Characteristics: The finest ingredients are carefully chosen and ingeniously combined to create a formula that responds to the ever expanding HIGH TECH needs of modern technicians. 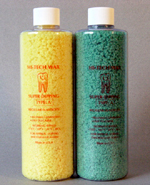 Remarkable elasticity yet consistent dimensional integrity are the family traits of SUPER DIPPING WAXES. The smooth even coating which reproduces in accurate details the surface of the die, allows virtually immediate and easy carving. The crush resistant copings come off the dies delightfully clean supporting flexible and sharp margins. Recommended working temperature for approximate coping thickness of 0.3-0.4 mm is 178ºF-187ºF (81ºC-86ºC) at room temperature 68ºF-72ºF (20ºC-22ºC). For best results dip dies quickly but gently in continuous mode. For posteriors with deep occlusion fossa plunge die with a twisting motion slanting it slightly, It will help avoid trapping air bubbles. Hi-Tech Waxe's Die Lube is a superb ultra thin lubricant for stone, metal, porcelain, acrylic and epoxy dies and numerous other surfaces to which it is applied. Wax patterns will come off effortlessly, specially with Hi-TECH waxes. 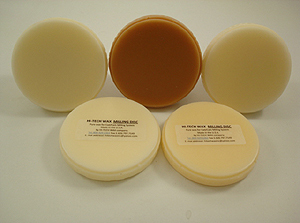 RPI (Reciprocal Parallel Interface Wax) is designed to create parallel surfaces in post and core cases and anti rotational grooves, where inconspicuous undercuts are available. RPI wax will reproduce all details of minor undercuts and it will prevent distortion during the removal of the wax up without the use of a block out wax. Direction: To create a parallel surface and to insure that you are reproducing all details of the die use RPI wax in undercuts, retention grooves, deep fossae pits, fissure and in areas that you feel necessary. Then proceed to dip the die in dipping wax, or build a crown with inlay wax. Remove the copping from the die and place it back on the die; this will create a parallel surface without distorting the copping, the post, or the crown. Then proceed with the sealing of the margins. The composition of the RPI wax will allow it to fuse to all HI-TECH WAX-es without leaving a worm line or a step effect in the pattern. 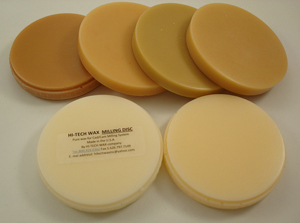 High temperature, high strength wax that has a great bonding to die spacer and will fill bubbles and undercuts easily. Dries fast, will not adhere to coping. This latest innovation of hand waxing instruments are made from the finest surgical stainless steel, and have an ergonomically balanced length and weight to maximize comfort and ease of use..
A highly inert, pure wax, it ensures dimensional integrity, specifically formulated to be strong, ideal for connecting wax patterns. Without bending or distorting the case. 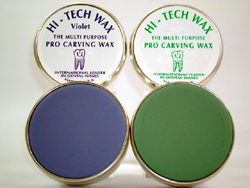 Hi-Tech Pressable Ceramic waxes are precisely formulated to prevent color contamination and are virtually ash free and they are compatible with all pressable systems.. Available colors for build-up are Beige, Turquoise, White & Emerald. Approximate weight 3 oz. (90 grams) can. Available color for margin is Light Yellow. Approximate weight 2 oz. (60 grams) can. Available colors for dipping are Ivory & Blue. Approximate weight 10 oz. (300 grams) bottle. 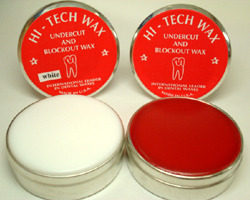 Basic introductory kit for technicians who would like to venture in the world of advanced technology with Hi-Tech Wax products. The Kit includes: Blue Margin, Green Inlay, Ivory Sculpturing Opaque, Red Blockout, Yellow Connecting & White Diagnostic Translucent. 6 cans 1/2 oz. (15 grams) each. 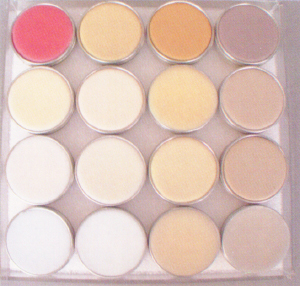 Hi-Tech Diagnostic Waxes belong rather on an artist's palette, with numerous opaque foundation shades and translucent incisals which cover the chromatic spectrum of the leading shade guide. This Diagnostic waxes feature the best qualities of sculpturing waxes - plus extra elasticity - virtually rivals the "vitrification" effect of ceramic crowns. Available in 8 Color Kit & 16 Color Kit. Approximate weight 1 oz. each (30 grams) can. 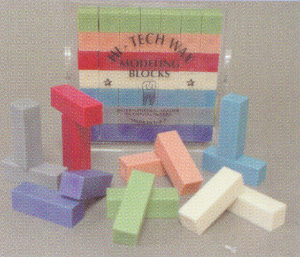 The opaque multi color wax modeling blocks are specifically designed to accommodate every aspect of sculpturing. 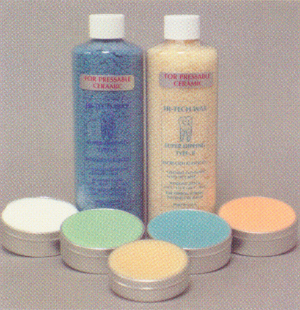 They are also designed to be used in the wax additive technique. Available colors: Green, Peach, Red, Ivory, Blue & Violet. One box of 49 blocks / 12x12x36.